Tropicalia | ARChive of Contemporary Music, or "Would You Take My Mind Out for a Walk"
As you may know ARC is building a Brasilian/Brazilian Collection. Now if YOU are building a Brasilian/Brazilian Collection, I think the next record you should get is Brazilian Guitar Fuzz Bananas, Tropicalia Psychedelic Masterpieces 1967 – 1976. (Tropicalia In Furs, USA, WPFC TIF 102, 2010). This was put together by Joel Stones, our pal over at Tropicallia In Furs, New York’s best (only) Brasilian/Brazilian record store. 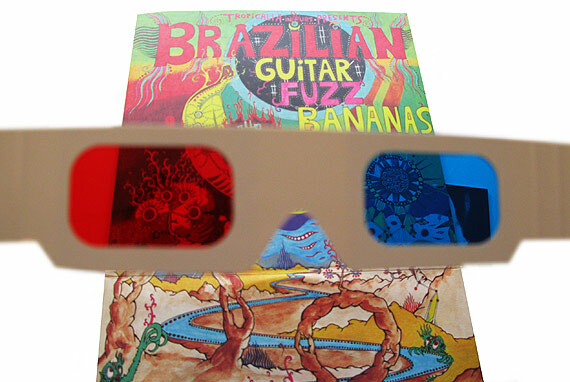 Bananas is a deluxe two record set, with a 3-D cover, appropriate viewing glasses, and a 48 page booklet insert providing details on all the source material in English and Portuguese. The discs sound wonderful and the illustrated booklet gives a bit of history and the inside scoop on the dogged tracking down of the sounds. You may think you’ve heard it all before, the soft sambas of the past, or those now-sound tinkly elctrobeats. Brace yourself. This is psychedelic, fuzz guitar, acid 60’s rock-solid+sloppy, loud, proud, funky druggie music. Like a good table set in Salvador, there’s plenty to eat, but you don’t know the names of any of the fruits. And occasionally there’s a bit of sand in that last bite. Cuts are taken exclusively from elusively available, mostly promotional Brazilian seven-inch singles. It was a time when Brasil was in dangerous flux, but a mere dictatorship couldn’t stop folks from creating great pop scrambles, like Celio Balona’s take on the Batman theme, “Tema de Batman”, or Mac Rybell glow in the dark version of the Stones’, “Lantern”. Not that all of these songs are covers, but a visiting scholar, Tom Cvikota, noticed that “Som Imaginario De Jimmi Hendrix”, may begin with a Experience-like crescendo, but is an unaccredited cover of the James Gang’s, “Funk 49”. ARC regularly trades with and shops at Tropicalia. Sure it’s predictably colorful, and fun, and Joel is cute and lovable and knowledgeable – but go anyway.